Happy Teacher Appreciation week! It's time to appreciate the teachers! 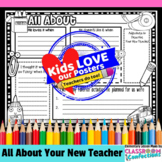 Have your students fill out this sheet and see how much they know about their teachers! It even gives them a place to doodle a cute little picture of them and the teacher! 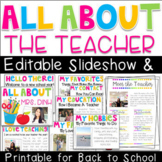 A sweet template for your back to school night or parent night! Click the blank template and type your information! Add your picture and you're done! Leave comments or feedback if you'd like to see different titles within this resource! Thanks!! 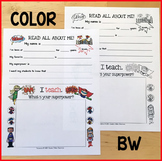 This mini packet will be a hit with your students! They LOVE to talk about you! Use it at the end of the year for a mini writing project. 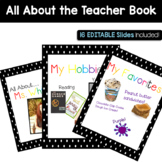 EDITABLE All About the Teacher Book! Great for Teacher Appreciation Week. 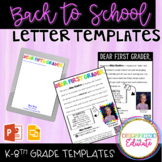 Have your students fill out the questionnaire or have them write a Thank You note to their Teacher or someone else in the school. Available in color or black and white. It's always so much fun to see what your students remember about you. 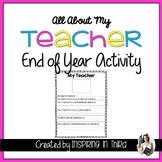 I use this as an end of the year activity. I use this powerpoint as a bulletin board and display it at Open House. It is all about the teacher. I also require all of my student teacher's to do the same. 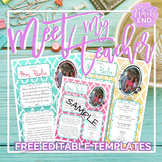 A unique way to let parents and students know all about their upcoming teacher. Perfect to add to beginning of the year paperwork. PDF example provided. Editable Microsoft Publisher file. Credits page highlighting fonts and graphics used. Here are 22 different slides to choose from to brighten up your teacher handouts. Included is a sample of what you could add to yours. Could be used in your power point, website, handouts, etc.